Please adjust your settings from the game room menu options. Improved AI scripting with additional commands and direct transport unloading. No rec compatibility break, so this release remains R7. 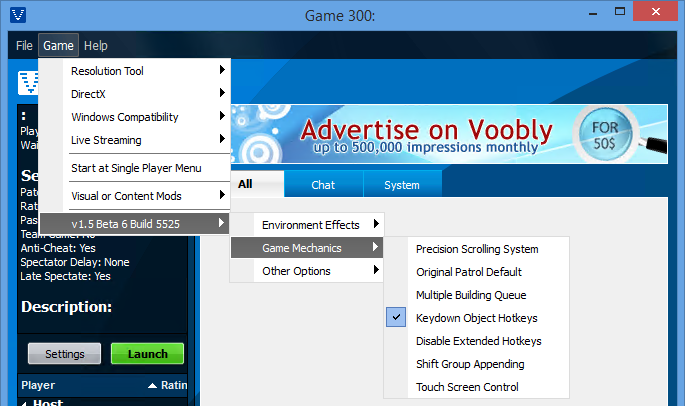 New menu option: "Game Mechanics->Disable Market Ctrl Keys" to disable Ctrl and Ctrl+Shift. Hidden Scores option now displays names and team numbers onscreen. Client: Added support for Hidden Scores in the game room settings. WK will require an update before you can use these new separated hotkey entries. Please use the palisade gate/feitoria and genitour/siege tower entries until then. Pathing should be smoother for non-scenario games at 250 population cap or lower. This will not change pathing routes and is intended to minimize stop-and-go motions. Pathing for scenarios and 275+ population cap games will operate exactly as before. Rms/Scx: The ATTR_TRAITS no-delete flag will not block incomplete foundation cancellation. Rec: Hold "Shift" when clicking the Flare button to enable wall scanning to find holes, etc. Fixed issue where holding "Alt" when right-clicking to garrison may target objects instead. Fixed issue with excessive pathing lag for minimum range unit auto-retreating. Fixed issue with garrison arrow count updates for building foundations (yasama). Fixed issue with incomplete gaia object lists in the scenario editor. New rec version id VER 9.F replaces 9.E due to several sync breaking fixes. Backward compatibility for v1.5 Beta R6 recs (9.E) and v1.4, v1.3, v1.0c, v1.0b recs. Please check and confirm your game room menu options for R7. Rms/Scx: GAIA_SET_PLAYER_DATA the DATA_MODE_FLAGS to adjust spies/treason buttons. The multiplayer setup screen now preserves the last hosted game type except scenarios. No rec compatibility break, so this release remains R6. Rec: Hold "Shift" when clicking another player's object to switch without changing view. Fixed issue with gaia conversion handling in scenarios and campaigns. New menu option: "Game Mechanics->Custom Normal Mouse" for a smooth, system aoc cursor. New menu option: "Game Mechanics->More Hotkeys Priority" to prioritize More over go-to hotkeys. New menu option: "Other Options->Faster Single Player" to match multiplayer speed levels. New menu option: "Other Options->Background Audio" for audio while multitasking. Client update fix: Hold "Ctrl+Alt" when right-clicking to move without targeting. Rec: Adjust speed: "Ctrl+Left" for slower, "Ctrl+Right" for faster, "Ctrl+Shift+Down" for normal. Rec: Locate King/Guard: "Ctrl+Shift+Up" or hold "Ctrl" when clicking the Idle Villager button. Rec: Hold "Shift" when using the player name dropdown list to switch without changing view. No rec compatibility break, but the additional menu options require a new id. Please check and confirm your game room menu options for R6. Fixed issue with Friend/Foe color swaps due to cartography, spies, and diplomacy.